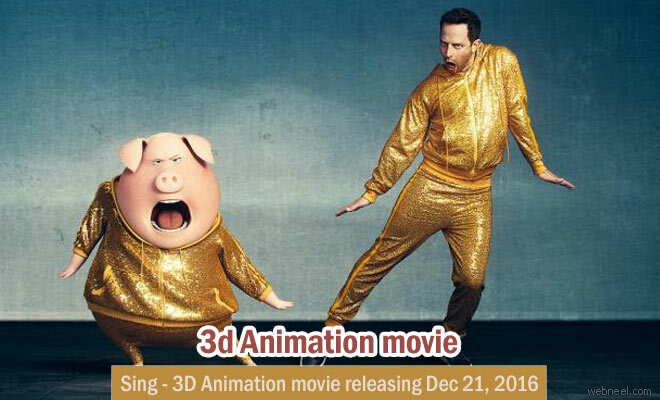 The latest production of Illumination Entertainment, 3D animation and musical comedy film 'Sing' is all set to release on December 21st, 2016. The voice cast is by Matthew McConaughey, Reese Witherspoon, Seth MacFarlane, Scarlett Johansson, John C. Reilly, Tori Kelly, Taron Egerton, and Nick Kroll. It has 85 classic music tracks from popular artists and also features a original track named 'Faith' by Stevie Wonder and Ariana Grande. The animation movie was first premiered in the Toronto International Film Festival which was held on September 11, 2016. According to IMDB, "A koala named Buster Moon has one final chance to restore his theater to its former glory by producing the world's greatest singing competition". Matthew McConaughey is the voice cast as Buster moon. Reese Witherspoon voice casted as Rosita, a domestic pig who gives u her musical dreams to marry Norman. Scarlett Johansson as Ashley, a crested porcupine punk rocker. Nick Kroll as Gunter/Bob, a domestic pig. Seth MacFarlane as Mike, a white jazz mouse and many more.